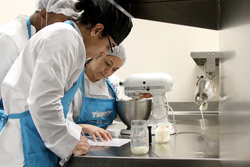 Stephen F. Austin State University students Josué Santoyo, Matthew Deas and Raquel Martinez participate in a competition to make whipped cream. The competition was part of a Dairy Max presentation in SFA's School of Human Sciences. NACOGDOCHES, Texas - With standing mixers at the ready, teams of Stephen F. Austin State University students eagerly await the signal to kick off their competition. Three, two, one, and the students are off mixing ingredients to be the first to make whipped cream. Recently, representatives from Dairy Max, a nonprofit dairy council representing dairy farm families across Texas, Oklahoma, New Mexico and Southwest Kansas, spoke to students enrolled in principles of food science courses in SFA's School of Human Sciences. Sarah Ryan, Dairy Max program coordinator, registered dietitian, SFA alumna and former SFA student regent, discussed how the company works with dairy farmers and the nutritional value of milk and other dairy products. Ryan and her colleagues Katie McKee and Monica Silva informed students on the science behind milk's role in the diet and in recipe applications. Students sampled two-percent, almond and pea milk while discussing the nutrition cow's milk provides. Dairy Max representatives also shook things up - literally - by having students shake heavy cream in jars to create butter. Students viewed and discussed different yogurts and why cow's milk is ideal for making creamy yogurt. Ryan also gave a frothing demonstration and explained the science behind why cow's milk is better than others. "The presentation was very informational and helped me learn more about the dairy industry and how to make things like butter and whipped cream," said Raquel Martinez, SFA junior from Tyler. The class ended with a taste of their homemade whipped creams over ice cream sundaes. Jill Pruett, adjunct instructor at SFA, helped organize the demonstration and visit. "The beautiful part of this presentation is Sarah is an SFA alumna, so it shows students what types of opportunities are available once they graduate," Pruett said. "I love when we are able to bring new energy to a topic and reinforce key concepts that we cover in class." Likewise, Ryan and her team said they enjoyed sharing their knowledge with students and introducing them to new aspects of food science and nutrition. "I have a special place in my heart for SFA," Ryan said. "This class got me excited about food science, and I was thrilled to come back and share more about food science and how dairy fits into nutrition." For more information about SFA's School of Human Sciences, visit sfasu.edu/hms. To learn more about Dairy Max and to find #DairyAmazing recipes, visit DairyDiscoveryZone.com. 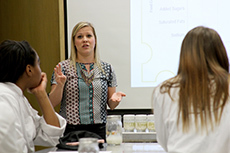 Sarah Ryan, Dairy Max program coordinator, registered dietitian, Stephen F. Austin State University alumna and former SFA student regent, discusses nutritional aspects of milk with students in the School of Human Sciences at SFA. During the presentation, students learned how to make butter and frothing techniques.